(Note: This is not a nuclear receptor, although it shares many characteristics of the family. AHR is a member of the basis-helix-loop-helix, PAS domain (bHLH-PAS) family.) 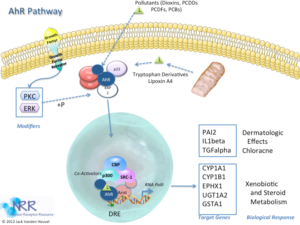 This gene encodes a ligand-activated transcription factor involved in the regulation of biological responses to planar aromatic hydrocarbons. 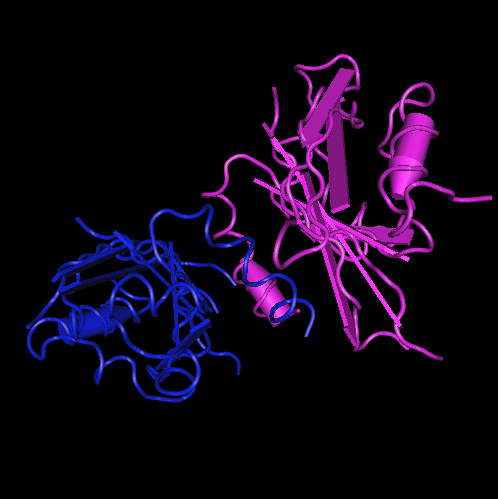 This receptor has been shown to regulate xenobiotic-metabolizing enzymes such as cytochrome P450. Its ligands included a variety of aromatic hydrocarbons. There are 218 articles specifically referring to this gene in PubMed. 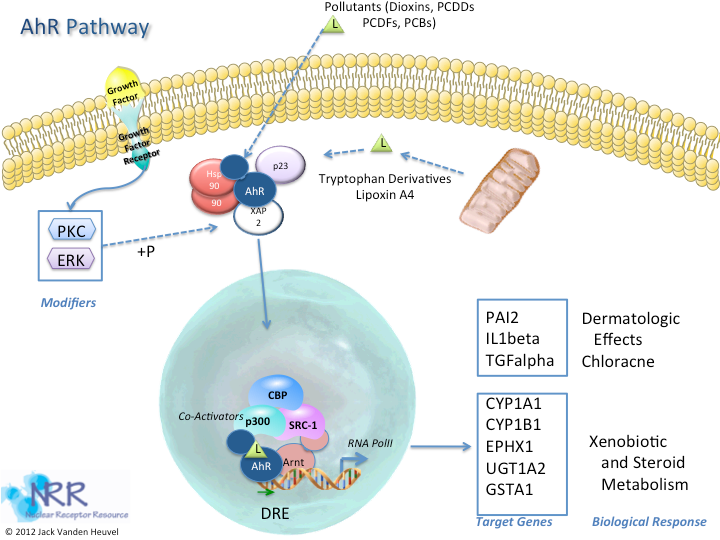 Functionally, the gene has been tested for association to diseases (Adenocarcinoma; Adenoma; Breast Neoplasms; Carcinoma, Non-Small-Cell Lung; Carcinoma, Small Cell; Cell Transformation, Neoplastic; Chloracne; Endometriosis; Esophageal Neoplasms; Genetic Predisposition to Disease and 13 others), proposed to participate in a pathway (Ahr Signal Transduction Pathway) and processes (positive regulation of RNA polymerase II transcriptional preinitiation complex assembly, positive regulation of transcription, DNA-dependent, prostate gland development). Proteins are expected to have molecular function (sequence-specific DNA binding) and to localize in cytoplasm. Putative protein interactors have been described (AHR, AIP, AR, ARNT, ARNTL, CCNT1_, CUL4B, DAP3, EP300, ESR1 and 21 others). AhR Reporter Cells are prepared using INDIGO’s proprietary CryoMite™ process. This cryo-preservation method yields high cell viability post-thaw, and provides the convenience of immediately dispensing healthy, division-competent reporter cells into assay plates. There is no need for intermediate spin-and-wash steps, viability determinations, or cell titer adjustments. The principle application of this assay product is in the screening of test samples to quantify functional activities, either agonist or antagonist, that they may exert against the aryl hydrocarbon receptor. This kit product is an all-inclusive assay system that includes, in addition to AhR Reporter Cells, two optimized media for use during cell culture and (optionally) in diluting the test samples, a reference agonist, Luciferase Detection Reagent, a cell culture-ready assay plate, and a detailed protocol. The gene contains13 distinct gt-ag introns. Transcription produces 6 different mRNAs, 5 alternatively spliced variants and 1 unspliced form. There are 3 probablealternative promotors, 2 non overlapping alternative last exons and 5 validated alternative polyadenylation sites (see the diagram). The mRNAs appear to differ by truncation of the 5' end, truncation of the 3' end, overlapping exons with different boundaries, splicing versus retention of one intron. 270 bp of this gene are antisense to spliced gene loyky, raising the possibility of regulated alternate expression. Note that mRNA .bAug10 was found in vivo, although it is a predicted target of nonsense mediated mRNA decay (NMD).